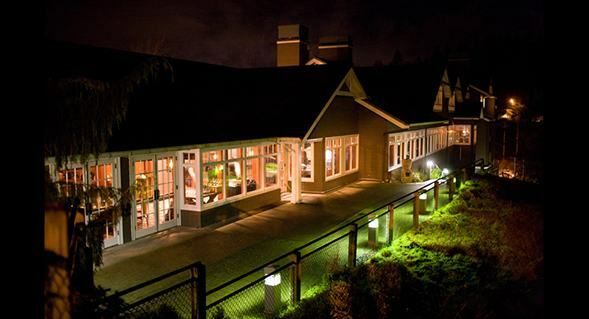 Ooooh baby it’s cold outside- and a perfect weekend to visit the Salish Lodge and Spa in Snoqualmie Washington. My birthday, my child with my parents, and the first cold snap of the year made for a cozy getaway only a few miles from home. The room was beautiful and home to a very comfortable Jacuzzi tub for two. But of course the real reason for getting away to a Lodge and Spa was to experience the Spa and that was at 9A the next morning. I ordered the Hot Stone Massage and he the Deep Tissue. We arrived a tad early to enjoy the surroundings and quickly regretted not bringing our bathing suits (we always forget them!). Two indoor heated Jacuzzis, one with a flowing waterfall, were inviting. Instead we lounged around the waterfall Jacuzzi with our herbal tea looking in on the folks in the Jacuzzi (if I had my druthers I’d change the seating to look out the windows to enjoy the greenery). I had not experienced a Hot Stone massage before and understand the origins are Native American. I relaxed under the skilled hands of my practitioner and LOVED having the hot stones follow her massage for a deeper, super heated rub. I tend to run cold so this was a huge plus for me. Even better were the heated clay bricks that were used to warm my back and legs prior to the massage. This too was new to me and I recommend it to all spas going forward, especially when giving massage in a room that may be on the cool side to start out with. Nirvana arrived when she used the hot stones in very small sizes to slide between my toes with one large one on my foot- then all wrapped papoose style in a towel. Heaven! All and all a great birthday weekend! I would go back in a heartbeat, but from my perspective this is a special occasion spot. Even with our “special promotion” it was on the spendy side in my book. Posted from Fall City, Washington, United States. After reading your description I HAVE to try a Hot Stone massage!!! Sounds like you had a well deserved, lovely birthday!